As of Oct. 1, Hailey residents will no longer be able to leave glass items in recycling bins for curbside pick-up. That could mean they will increasingly throw glass bottles and jars away in the household trash bin, a trend that could cost the county money in the long run? 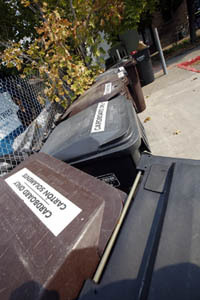 The reduction in curbside recycling options resulted from a recent county decision to streamline its recycling program. The elimination of glass was due in part to an injury suffered by a trash collector when a glass bottle broke during pick-up, leaving him with a 6-inch cut above the eye. In addition to safety concerns, the county has had trouble finding a financially feasible outlet for its used glass. The Hailey City Council was advised of the changes Monday night by members of a county advisory group charged with updating the recycling program. The type of recycling program recommended by the committee, and passed by the county, is called a “modified sort” system. Rather than having recyclers separately sort tin, aluminum, plastic, newspapers, magazines and mixed paper into bins, the new system would allow residents to simply sort materials into three groups—fiber (all paper items), metal (all cans) and plastic. Glass has never been recycled, per se, at the Ohio Gulch recycling center, but instead was dumped into a specific inert-materials zone in the landfill. But city officials say eliminating glass from curbside recycling is likely to mean people will toss it in with the rest of their household trash, which is transferred to Milner Butte landfill near Burley, for a fee. “Because the county made this change we could see tipping fees go up,” said Councilwoman Martha Burke, referring to the cost of trash transfers to Milner Butte. County resident Mike Thompson, a member of the recycling advisory committee, said at Monday’s meeting that the ideal circumstances for glass recycling would be re-using bottles that are returned for a deposit, a practice that takes place in 11 states. Thompson said recycling plastic, while it will continue under the new plan, is problematic from a “carbon footprint” perspective, since almost all plastic is shipped to China for recycling. City Administrator Heather Dawson said in an interview that drop-off bins for corrugated cardboard and glass will be placed at the Park and Ride lot on River Street, and at the Hailey Fire Station on Third Avenue. ( Hailey is in 32nd place in the SC Johnson Green Choices Recycling Challenge, a nationwide contest that aims to encourage waste reduction and increase household recycling. During the challenge, 50 communities, one in each state, are competing to see which has the highest recycling participation. The winning community will receive a $100,000 grant from SC Johnson for a community sustainability project. For more information, call Hailey Sustainability Director Mariel Platt at 788-9815.